Rotary International and ShelterBox, a grassroots disaster relief organization, signed a project partner agreement this month, allowing the two organizations to collaborate more closely to provide relief and temporary shelter to survivors of natural disasters. 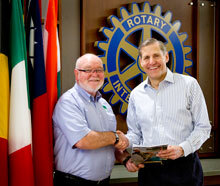 “Project partner” is a special status RI gives to groups started or managed by Rotary clubs. The agreement will build on the strengths of both organizations in responding to disasters all over the world. RI General Secretary John Hewko said the agreement will enable Rotary club members to have an immediate, lifesaving impact in communities hit by natural disasters. “ShelterBox will be able to ensure that local Rotarians are provided an opportunity to participate in the distribution of ShelterBox containers,” he said. Each ShelterBox typically provides a bespoke tent designed to withstand extreme weather conditions, stove, water purification kit, blankets, tools, and other necessities to help a family survive for six months or more after a disaster. Henderson, a civil engineer and former search-and-rescue diver for the British Royal Naval, founded ShelterBox in 2000. Its response teams of trained volunteers have brought lifesaving supplies to victims of more than 175 disasters in nearly 80 countries. Earlier this month, a ShelterBox team distributed more than 550 tents to communities in Madagascar where powerful cyclones left more than 250,000 people homeless. For a club program update about ShelterBox, contact Northbrook Rotarian ShelterBox Rep Donna Gulley.